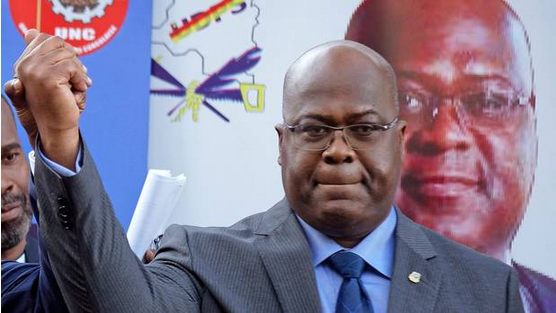 Opposition candidate Felix Tshisekedi of Union for Democracy and Social Progress (UDSP), has been declared winner of DR Congo's presidential election. In the provisional results released by the country’s electoral commission, Tshisekedi defeated Martin Fayulu, his rival who had since rejected the outcome— describing it as having “nothing to do with the truth of the ballot box”. If unchallenged, this would signal Congo’s first democratic transition of power since 1960 when the country gained independence. Tshisekedi, son of late opposition leader Etienne Tshisekedi, will take over from President Joseph Kabila who is stepping down after 18 years in office. Emmanuel Shadary, Kabila’s preferred candidate, came a distant third at the poll. There are reports that the electoral process was marred by irregularities, and this, many fear may lead to an uprising between supporters of the major contenders. The ruling party, whose candidate finished third, has not yet contested the result, prompting allegations of a power-sharing deal with Tshisekedi. A spokesman for Shadary, who had been Kabila's hand-picked candidate and was expected to win, accepted the defeat, saying "the Congolese people have chosen and democracy has triumphed". Addressing supporters at UDSP headquarters in Kinshasa, Tshisekedi said Kabila is no longer a rival.